After wooing the audience with her charismatic dance moves in ABCD 2, Shraddha Kapoor is now gearing up for next installment of the dance film. While the actors are teasing about the film with hashtag #3IsComing, the filming will begin tomorrow in Amritsar. Ever since the busy bee Shraddha Kapoor stepped into Remo Dsouza’s dance film, she has started prepping for it from day one. To keep the preparation on, Shraddha also took a dancer along with her on the recent schedule of Saaho shoot so that she can practice before the shoot and after the pack-up. 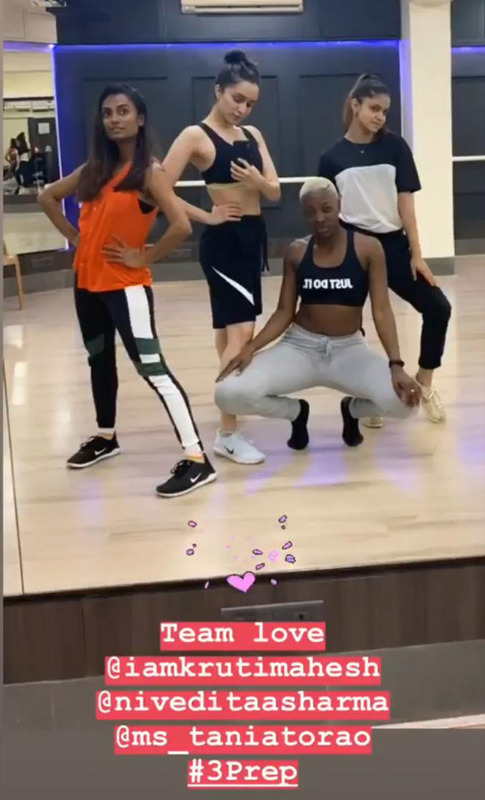 The actress took to her social media, on Monday, and shared a mirror picture of herself posing along with dancers captioning, “Team Love”. The actress is running a hectic record and constantly travelling between Mumbai and Hyderabad where she is shooting for the action film Saaho. On the work front, after the success of Stree, Shraddha Kapoor will be seen essaying varied characters in her upcoming films Saaho, Chhicchore, Saina Nehwal biopic and the next installment of ABCD. All of them are set to be released in 2019.